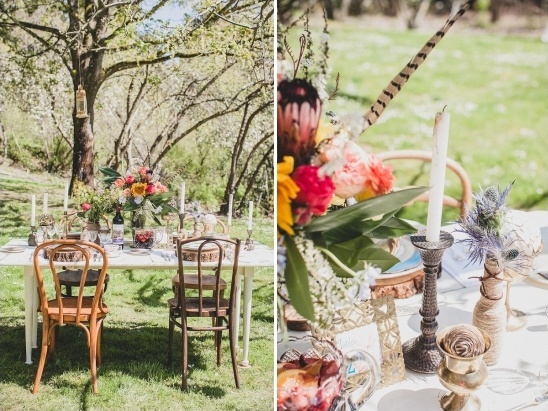 Hannah from Urbanista Weddings paired up with Tamara of Simply by Tamara Nicole to create a tea party photo shoot — which resulted in this stunning Bohemian-style wedding inspiration. 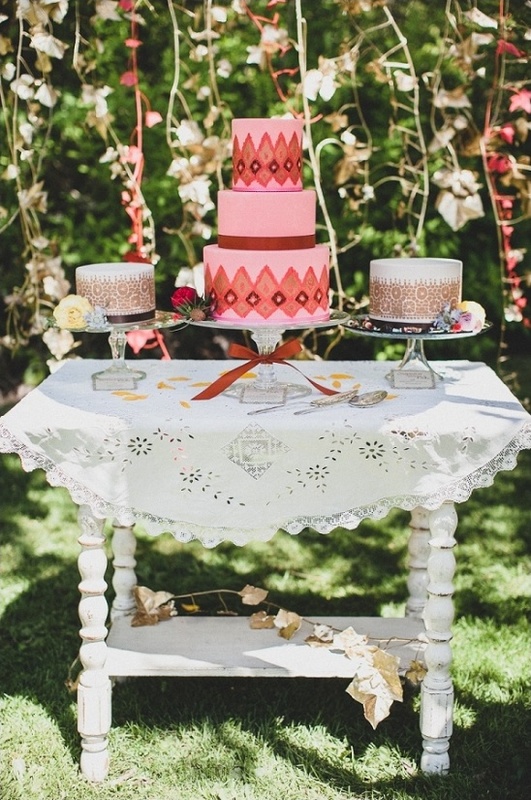 Simple DIY projects along with vintage and rustic items decorated the outdoor venue. 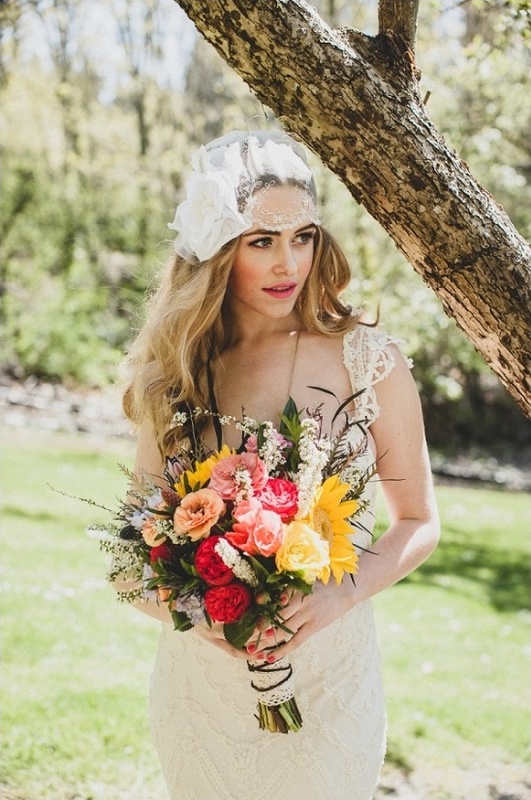 The assortment of lace dresses and hair accessories were complimented by soft bridal looks, tying up the boho chic vibe with a perfectly tidy bow. Continue reading to hear so much more from Tamara Nicole, including the easy DIY projects she put together for the shoot! 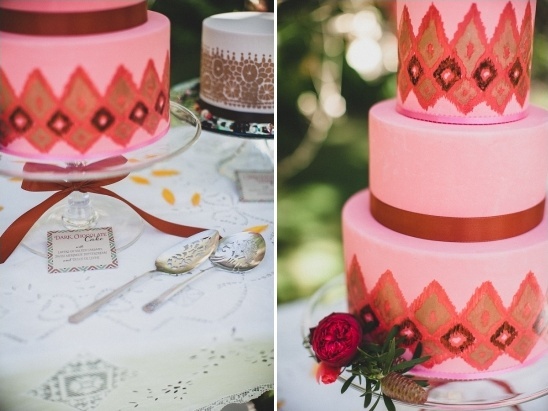 Can't get enough of these vintage boho chic wedding ideas? 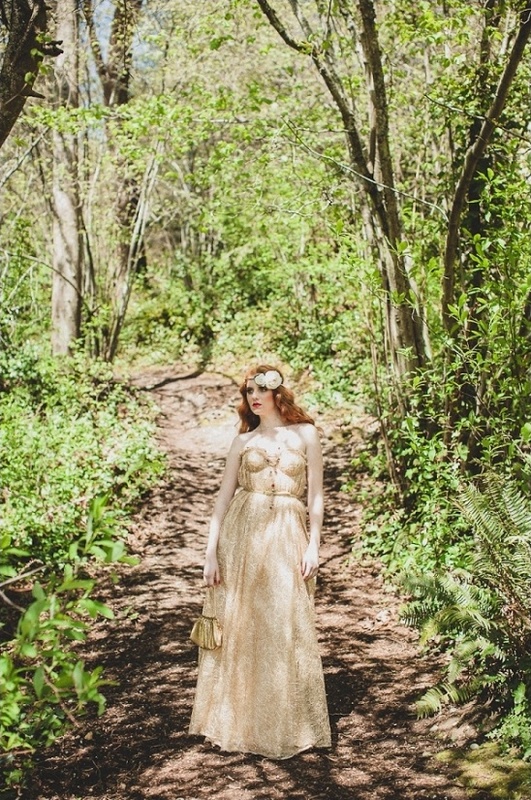 You can always see more in the full gallery here, all captured by the ever so talented Jaqueline Shumate Photography. 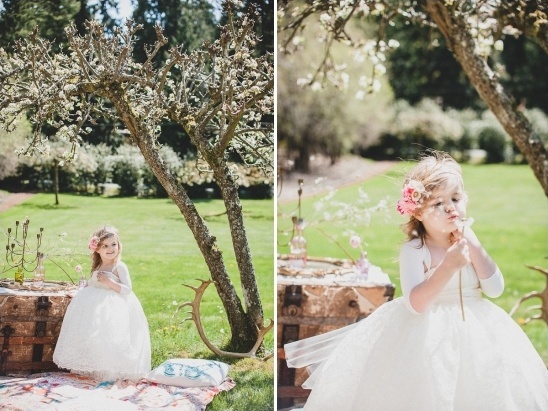 From Simply by Tamara Nicole:Hannah from Urbanista Weddings had posted something on Facebook about wanting to do a tea party shoot. 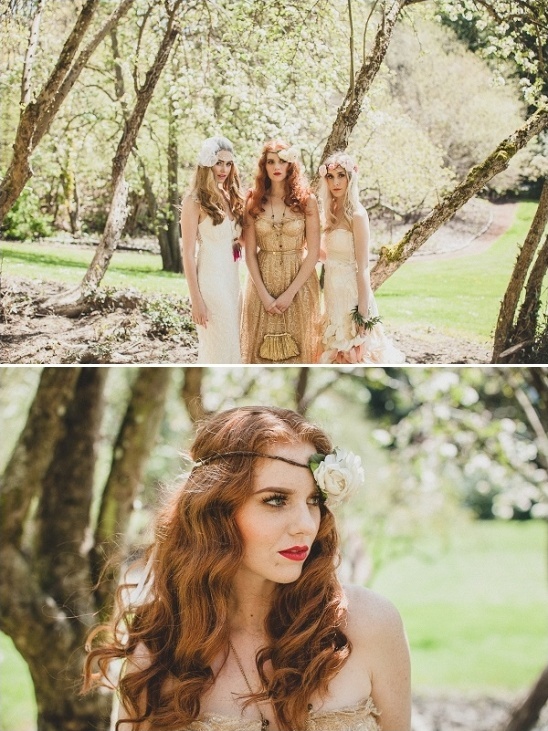 I jumped on that idea and we took it and ran...to a crazy fun Bohemian Chic styled shoot. 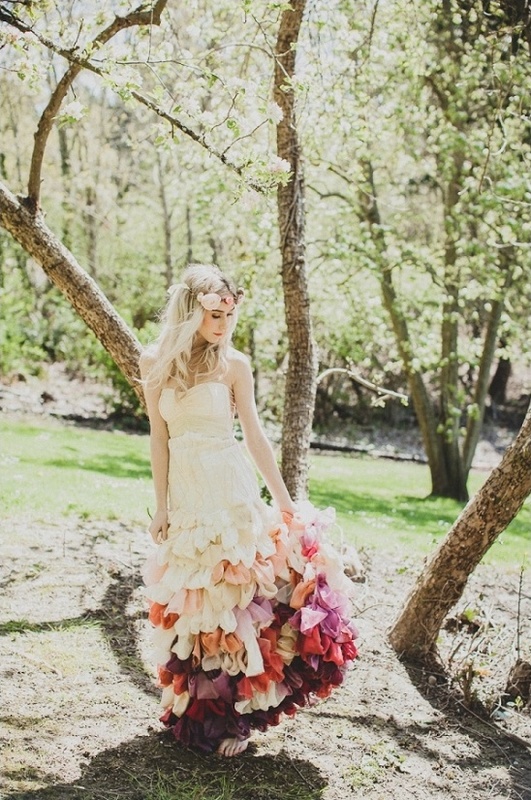 The Inspiration: bright pink and orange, white, lots of textures, lace, yarn, succulents, gold, fringe, girly and free! 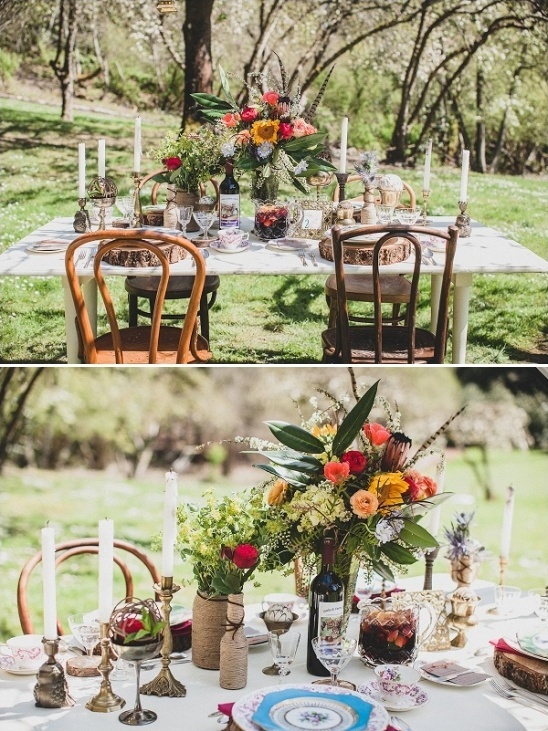 The vibe I was going for was obviously Bohemian with a twist of Gypsy, Hippy, chic, Moroccan, with some soft vintage romance. 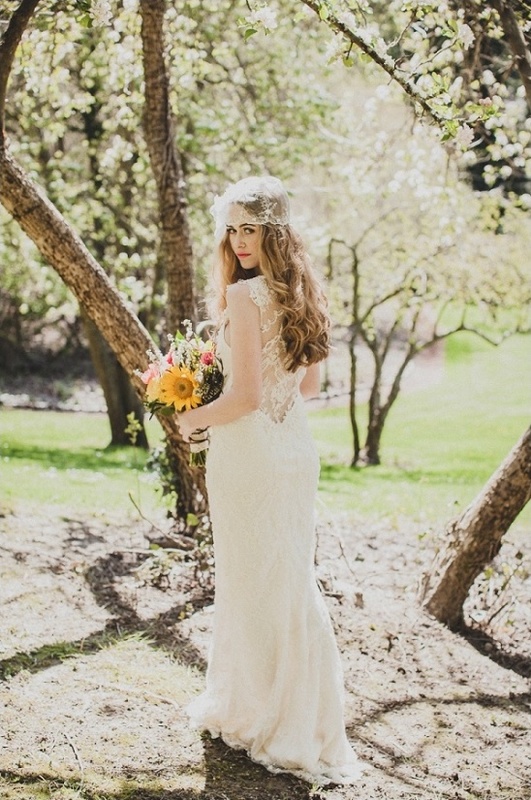 We just wanted to convey the free spirit of love! 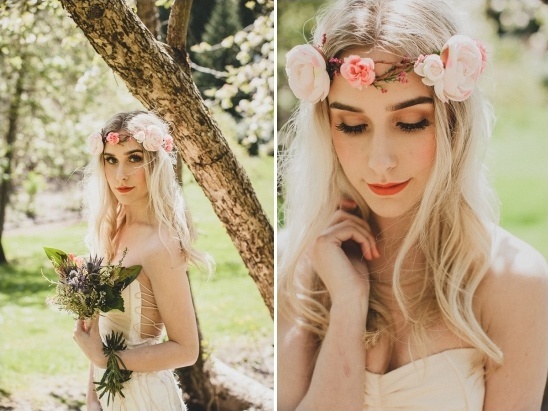 Hannah took the inspiration and created some chic looks for the models that brought out different aspects of our inspiration (using belts, layering, hair pieces, fun pink lip stick, etc). 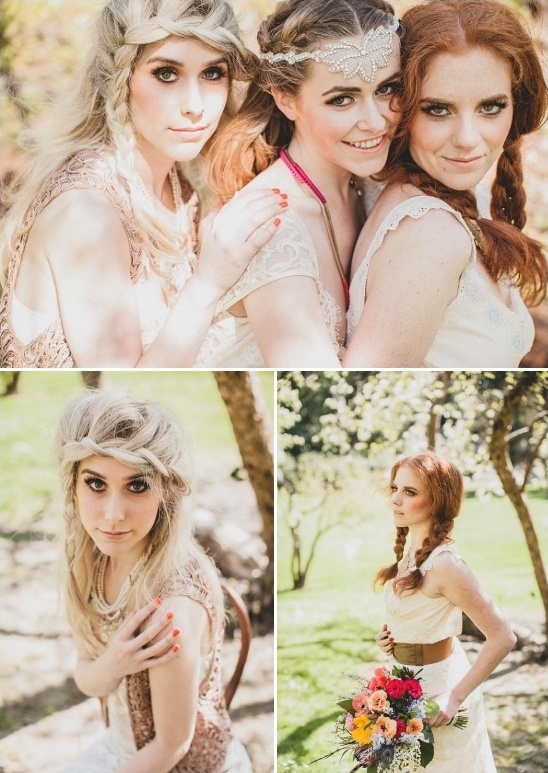 We chose a blonde, brunette and red head to show ALL brides with all shades of hair that they can pull this fun boho look off. 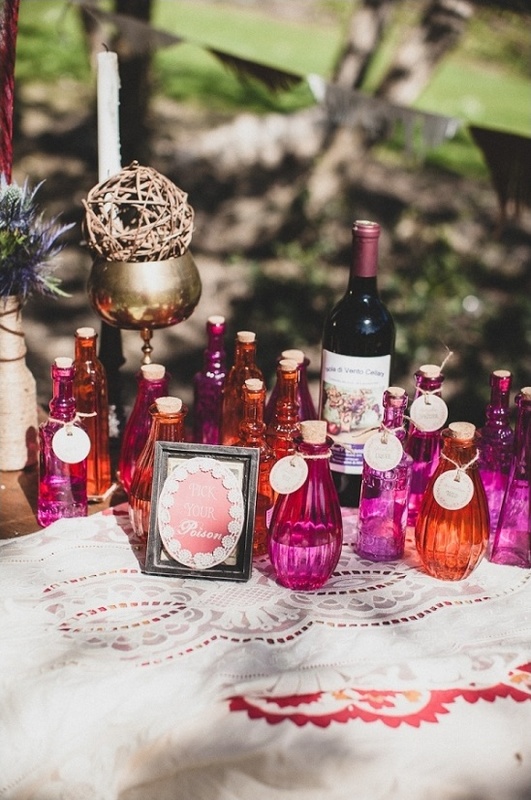 For the favors, along with the potted succulents we had "Pick your Poison" cocktails in colorful pink and orange potion bottles. The drinks were "Firefly," "Black Currant and Thyme Spritzer," "Incan Limeade" and "Nasturtium Wild" for the guests to choose from. 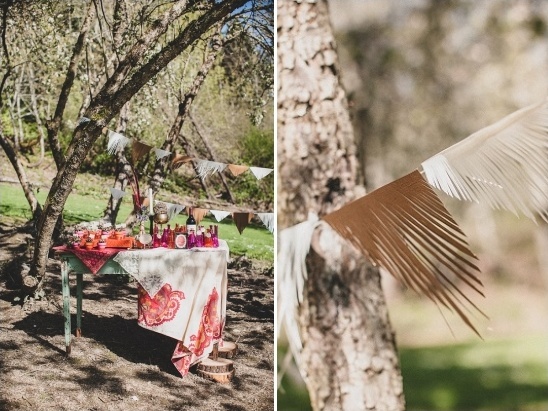 DIY #2: The fringe backdrop is easy on the wallet...all you need is some scissors, cardstock and some time (or help from your friends!). I cut various triangle sizes out and then just cut small fringe lines in them. 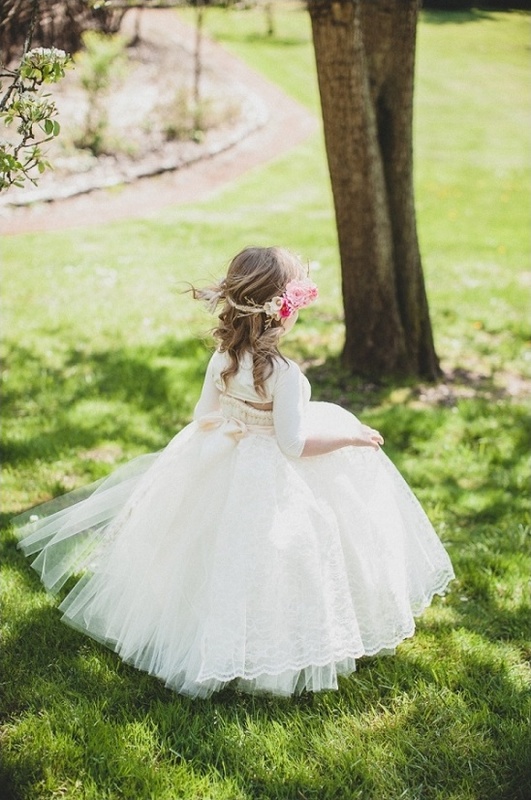 Then they were glued on to ribbon, and tied to trees. The can be layered and swagged back and forth for a more dramatic look. DIY #3: Also easy to do is the painted mini terracotta pots. I first painted the outside of the pots pink or orange, and then dipped them (at an angle) into some gold paint (by Martha Stewart). 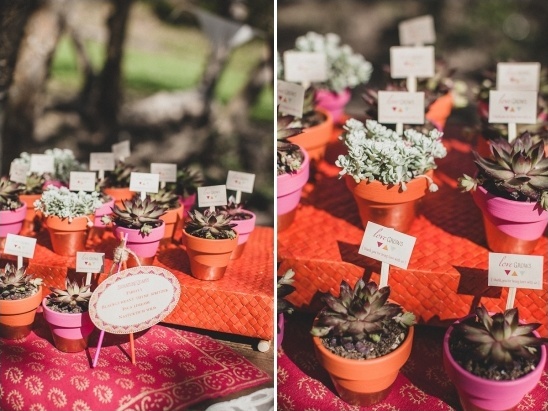 Add in some succulents and a cute tag (by Just Milled) and you have yourself some eco-friendly wedding favors that guests can take home and plant in their garden, or keep in their kitchen. 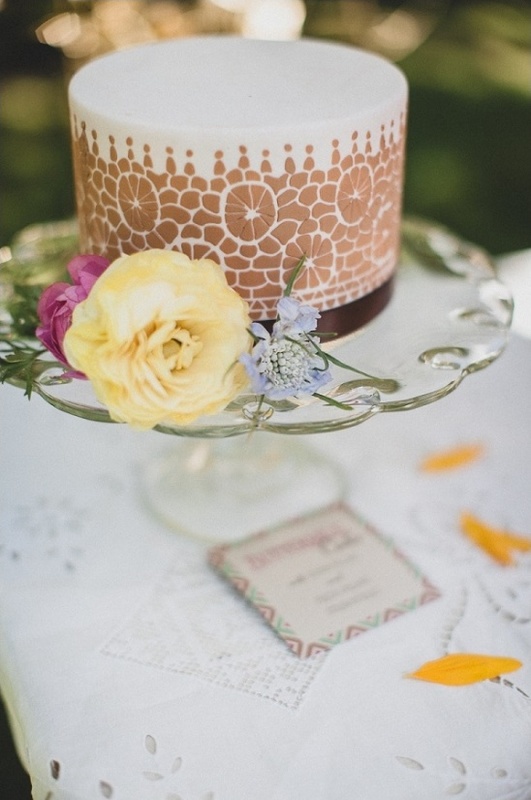 DIY #4: Another project that would be easy for any bride is the spray painted ivy backdrop behind the cake table. I am all about utilizing nature in shoots, so I grabbed some ivy from my backyard. I spray painted most of it shiny gold, and some of the strands a HOT pink. 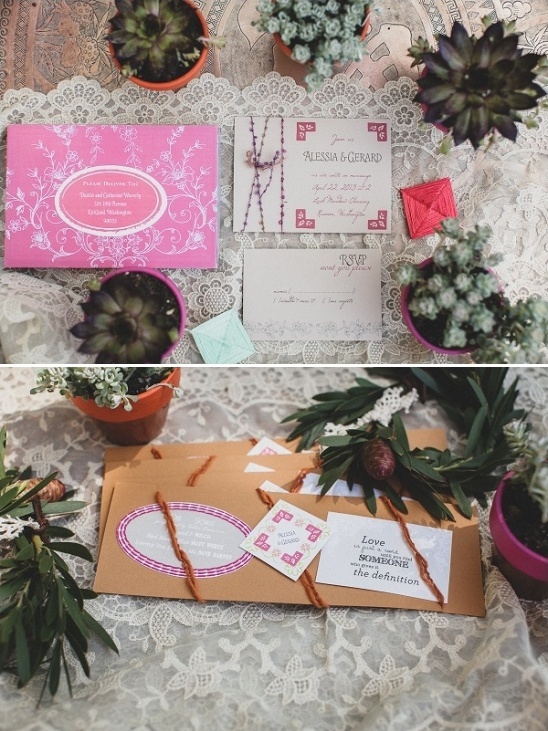 I love the contrast in colors with the green background, definitely makes the pink pop!